LPD-28, the 12th ship in the San Antonio class line, may serve as somewhat of a bridge to the upcoming class of amphibious transport docks, currently dubbed the LX(R). As part of this transitional vessel, Lockheed wants to install its vaunted Aegis Combat System aboard it, giving the ship a much higher level of defensive capabilities, independence and situational awareness. The Aegis Combat System is installed on the Navy’s 62 Arleigh Burke class destroyers and another operational 22 Ticonderoga class cruisers. The system is made up of four large SPY-1D phased array radars, as well as a slew of other sensors and communications nodes that are fed into an elaborate combat information center. The latest configuration of the system, known as Baseline 9, is capable of engaging air breathing threats, like fighter aircraft and cruise missiles, as well as ballistic missiles. It also provides anti-surface and anti-submarine warfare capabilities. Aegis is largely seen as the “gold standard” of integrated maritime warfare combat systems the world over. This may sound like a very nonchalant justification for adding many millions of dollars to a proven combat ship design, but it does make some sense. Giving the LPD-28 Aegis will allow it to operate independent of, and in better concert with the Navy’s already over-tasked Aegis equipped destroyers and cruisers. Considering how flexible the San Antonio class is, being able to execute a wide variety of missions, including everything from anti-piracy duties to counter-terrorism and disaster relief missions just to name a few, the ability for the LPD-28 to safely operate without Aegis equipped escorts in moderate to high threat combat environments would be a huge infusion of flexibility for the vessel. An Aegis equipped LPD-28 would also allow for enhanced amphibious operations, being able to defend itself and ships around it from air breathing, surface and subsurface threats (to some degree), while traditional destroyer or cruiser escorts can be reduced in number and/or focused on anti-ballistic missile defense or spreading a wider defensive net over an region. Currently only the most advanced “Baseline 9" Aegis equipped ships can defend against air breathing and ballistic threats at the same time, and even that capability is somewhat limited. The idea of a San Antonio class LPD armed with medium-range surface-to-air missiles is not a new idea. The class was actually built with an area set aside for a 16 cell Mark 41 vertical launch system. If loaded with Evolved Sea Sparrow surface-to-air missiles, this would give these ships 64 highly capable air defense missiles at their disposal. In other words, an LPD-17 class ship could sanitize the airspace for dozens of miles around. Theoretically, a mixture of weapons could be carried instead depending on what sensors and control hardware is installed on the ship. RGM-109 Tomahawk cruise missiles could occupy some of these cells, or even Standard SM-2/6 long-range surface-to-air missiles could theoretically be carried. In fact, even if these older San Antonio class ships were not upgraded to use these missile cells themselves, they can act as arsenal ships for an Aegis equipped LPD-28 and potentially LX(R) standard ships, or even their destroyer and cruiser escorts. It must also be noted that variants of the San Antonio class have been put forward as dedicated ballistic missile defense ships in the past. These ships would also leverage the Aegis Combat System, although they would dispense entirely with the amphibious mission and instead be equipped with hundreds of vertical launch system cells. Beyond air defense, having the ability to strike inland hundreds of miles, or even at enemy ships in the region, would give LPD-28 and its predecessors a valuable capability. This way, a single ship could deliver special forces deep behind enemy lines with their embarked MV-22s Ospreys and provide fire support for these forces if need be far out of reach of AH-1 attack helicopters. This fire support could come in the form of the latest Block IV “Tactical Tomhawks” that feature in-flight re-tasking, and soon, anti-ship capabilities, or more likely via a smaller missile with shorter range. The Naval Strike Missile would be a clear contender for such a role. With this in mind, the LPD-28 could really be a “Navy in a box,” or a self-contained fight unit that can be sent to respond to a massive range of contingency operations, even in higher threat areas. 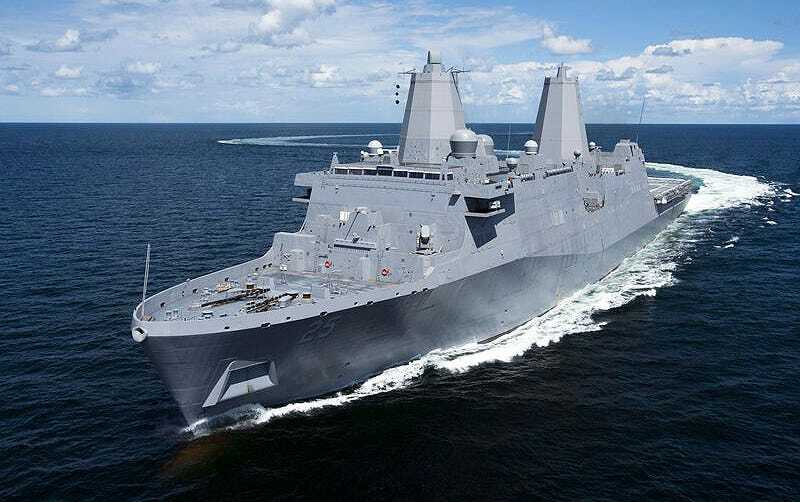 Although such a capability would add substantially to the ship’s cost, it would usher in a new independent concept of operations for an LPD, one that could give the Navy and Marines a super flexible and highly efficient resource to deploy without a full flotilla of complex support vessels. In the end, enhancing future LPDs and even “up-missiling” the 11 San Antonio class ships that have been built or are in the process of being built would be a perfect fit for the Navy’s “distributed lethality” initiative. At the same time, it would add to the cost and complexity of the LPD concept. The next LX(R) amphibious transport dock ships are looking to be cheaper, simpler vessels than the San Antonio class, not the other way around. Even a “flight II” of San Antonio class ships aimed at fulfilling the LX(R) requirement will lack some of the features of their predecessors. Still, nothing is set in stone as of now for this upcoming class of ships, and maybe if the LPD-28 gets Aegis it will prove itself as too useful to be omitted on the follow-on class design. Then again, it could also be a costly fumble, in which case at least only one ship will be suffering the consequences.